Entertainment this week has revolved around knitted palm trees. The tiny buttons may not look like coconuts to anyone else, but they do to me! Repetition is no bad thing when you want to churn out a few little quilts, but I have to confess that I am getting a little bored and need to do something different soon. It's all getting a little too deja vu at the moment. Having said that, I particularly like the shades of blue in this quilt. ...and the butterflies on the backing are an absolute delight. Here goes for Week 155. 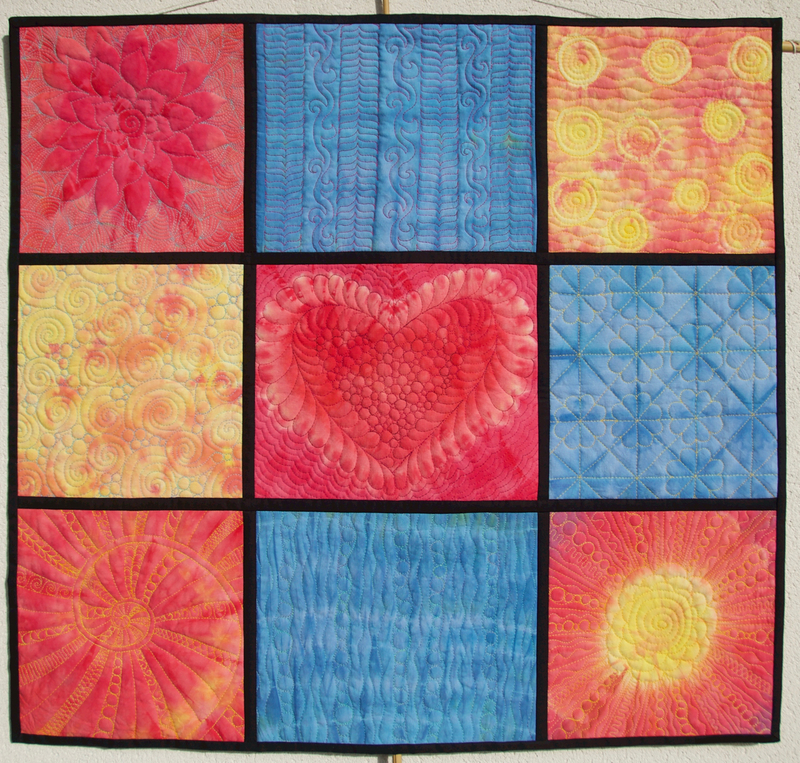 The project that caught my eye in Week 154 was Karen's mini quilt enhanced with fabric paints. If you haven't seen her blog post yet, nip over now and have a closer look. Linking up to Sarah's blog Confessions of a Fabric Addict for Whoop Whoop Friday. Unplanned, random, just plain fun. After a gap of about thirteen years, I have picked up my knitting needles again and made something. Joining a church knitting group introduced me to twiddle blankets, and I was away. The stash of wool that has been rammed into an upstairs cupboard for years is gradually reducing. This first blanket is in effect a giant sized tension square, giving me the method for future projects. I have used chunky yarn, or a double strand of thinner yarn, so that it grew quickly. To keep it flat and warm, I used a basket weave stitch which gives snug texture. For the twiddle factor, I sewed on buttons and knitted flowers. The flowers are easy to make and have the habit of furling themselves up, just like real flowers. Using double strands of yarn gave me the opportunity to do a bit of colour blending. This dark and light green blend definitely looks like a 1950s gardener's jumper. The chunky picot edge down one side wasn't in the plan at the start. I had to disguise a rather loosely worked edge somehow. There is still plenty more wool upstairs. I think I shall end up making a few of these blankets. One of my favourite fabrics ever is running out. I love these butterflies! The fact that they are printed in monochrome doesn't detract from their beauty. They are accurate representations of butterflies I recognise and often see (peacocks, red admirals, orange tips), and some I would love to see more often (for instance, the Camberwell beauty, of which I have only ever seen one, in Poland). Today I have been putting the binding on a cradle quilt, and earlier this week I stocked up on fabric so I have plenty of backing when I make more. How long will it take me to get through nearly fifteen metres of backing fabric? I'd better get cracking with some more quilt tops. Here goes for Week 154. The project that caught my eye in Week 153 was Olena's tie dyed sampler. If you haven't seen her blog post yet, nip over now and have a closer look. Suddenly my life has been filled with flowers. Knitted ones. They are the perfect addition to the twiddle blankets I have been making, and a great way to use up small left over balls of wool. This flower measures three and three quarter inches across. Because I wanted a sturdy and firm finish, I used a double strand of double knitting yarn on 4mm needles (no. 8 in the old sizes). Knit stitch is used throughout. Cast on 9 stitches, and leave a tail of yarn hanging which will be used later for sewing the flower onto the finished item. Knit 8 stitches, leaving the last stitch on the left hand needle. This is the only row where the first stitch is not slipped. Turn, ready for the next row. ...and knit to the end of the row. ...and knit 6 stitches, leaving 2 on the left hand needle. Turn, slip one stitch, and knit to the end of the row. Turn, slip one, knit 5 stitches, and leave 3 on the left hand needle. This is the idea - the centre of the flower is on the left, where the tail is hanging from the casting on. The outer edge of the flower is on the right. Each time you knit towards the centre you leave one more stitch on the left hand needle. Keep on going, until you only need to slip one, knit one, and leave 7 stitches on the left hand needle. Turn, and knit your shortest most irritating row ever. Slip one, knit one. Turn again, and you have a natty little triangle. Now cast off 8 stitches in the normal way, just making sure you slip the first stitch. The first petal is finished! Five more to go. When you have six petals, cast off completely. ...and also to stitch the flower securely to the main item. All it needs now is a button in the middle. Job done, and guaranteed addictive. Linking up with Sarah's blog Confessions of a Fabric Addict for Whoop Whoop Friday. If there is an element of deja vu to this cradle quilt, it is because I made a job lot of strips of squares some months ago and am just coming to the end of them. This quilt is very similar to one I made earlier this year, even using the same beige check for the strips between the squares. However, I have a rule. No two quilts can be identical. ...with more of the beige check for the backing. Somehow this quilt has a no nonsense feel to it, as though any baby that sleeps beneath will turn out to be sensible, hard working and practical. Wouldn't that be nice. Here goes for Week 153. 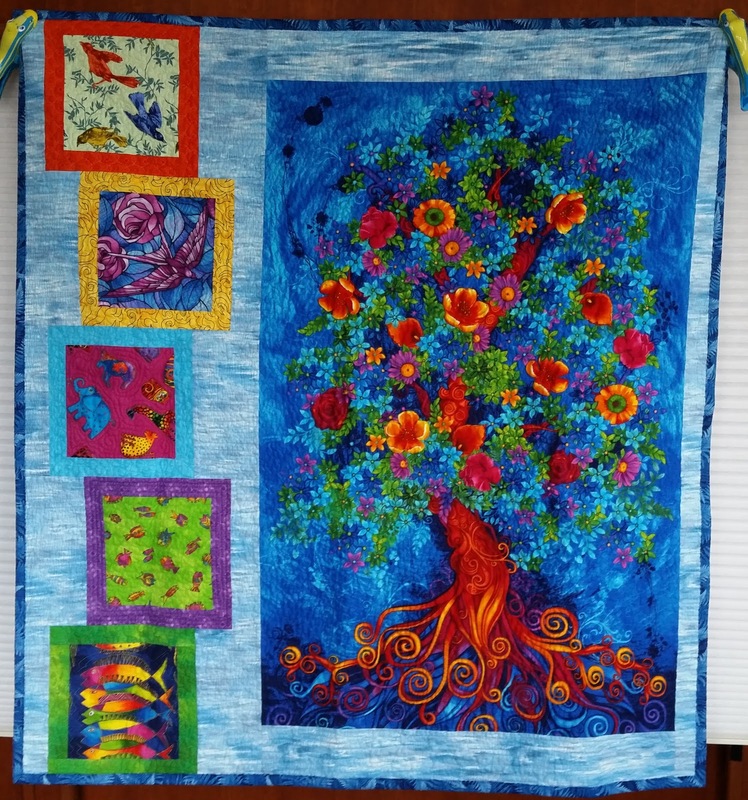 The project that caught my eye in Week 152 was Louise's Fiery Tree quilt. If you haven't seen her blog post yet, nip over now and have a closer look. Having climbed to the top of the tower at Sissinghurst, I had to take a picture of the beautiful Elizabethan brickwork. These flowers have kept me busy with my latest knitting project. They are totally addictive and easy, and I have been making them to add as decoration to a twiddle blanket. So far I have been using up red and yellow wool, and have made them all the same size. However I can see how they can be varied, and what a pretty decoration they would be for a little girl's winter hat. ...and the colours of the scooters in the centre called out for shades of pink with browns and greys. ...and some reindeer on pinkish grey. ...and the reindeer put in an appearance on the back. I loved working with these colours. Somehow the finished effect was restful, perfect for a peaceful baby. Here goes for Week 152. The project that caught my eye in Week 151 was Dione's charity quilt. If you haven't seen her blog post yet, nip over now and have a closer look. Every time we go to stay with my brother he makes sure we have an outing. The latest trip was to Ightham Mote in Kent. This has to be one of the most beautiful courtyards I have ever been in. There is a frighteningly large stash of wool in my cupboards that I haven't touched for at least thirteen years. Somehow having lively children around the house and knitting didn't mix. Now the children are gone and it is time to clear the house out. It's a gradual process, partly because knitting my way through a mountain of wool will be a lot slower than just passing it on. Also, until now, I didn't have any clear idea of what to make. The solution was to join the knitting group at a local church and see what projects they had. The choice was between baby blankets or twiddle blankets. I opted for the latter. Rather than knit squares to be made into blankets, I am making a small lap blanket with added interest. The basket weave stitch is quick and easy, has a lovely warm texture, and lies nice and flat. Here is the method. You need an even number of stitches. Instructions are given for a number of stitches divisible by four, with instructions for stitches divisible by two but not four in brackets. Now I have finished the knitting and am adding the twiddle factor. It has been a great thrill getting the knitting needles out again after so many years. My mum taught me to knit when I was six. She wasn't a knitter herself, but she was able to teach me how to knit, purl, cast on and off, and increase and decrease a stitch. After that I was on my own and became a regular at the local wool shop and a tea cosy specialist. Now my knitting ambition is to be a twiddle blanket specialist and avoid the wool shop.